Data Truck WiMax Internet Service. Data Truck WiMax lets you enjoy internet at home, work, or even on-the-go (with optional car adapter), anywhere inside our coverage area. Our self-install modems are easy to setup for same-day service, and are available with onboard Wi-Fi. To get signed up, call us at (605) 886-7070 or stop in to our office at East Point Plaza, 420 4th St NE (North HWY 81), Lower Level Suite 17. NOTE: At this time we are only able to take new WiMAX Self-Install customers in limited WiMAX coverage areas. Please check back here for updates. Thank you for your patience. Q. How fast is your Internet service? A. FAST! Our WiMax service provides you with downloads of up to 2 mbps (mega, or million, bits per second) depending on the service you choose. This is much faster than most Dial-up (0.02 ~ 0.05 mbps) and even Satellite and DSL service (0.2 ~ 1.0 mbps). Q. Is your service limited? How much can I use it per month/day/etc? A. Our service is unlimited. You are always connected to the Internet with Data Truck, and you can use it as much as you want, 24 hours a day, 7 days a week. We do not place restrictions on downloads, and we do not charge extra for "overages". Q. Why do I need a modem to use your WiMax internet service? My computer already has wireless; can't I just use that? A. No. This is a question we hear all the time. The term "wireless" is a bit ambiguous in technology, and some explanation is necessary to better understand the answer. The wireless that's built into your computer is most likely Wi-fi (also known as 802.11 a, b, n, or g). This is a short-range wireless technology, using low-power signals on unlicensed frequencies and designed to provide local internet access within a building or small area (usually about 300 foot radius). The signal is transmitted from a Wi-fi router or access point, which needs to be connected to an internet provider. In contrast, our WiMax uses high-power signals on FCC-licensed frequencies to deliver our service throughout most of the city. A WiMax modem is required to receive our signal because your computer doesn't know how to "speak" to WiMax. This is basically the same reason you cannot use your home cordless phone as a cellphone. Both devices are wireless but they use different frequencies and protocols and therefore are not interchangable. Q. My satellite TV/internet service sometimes stops working during bad weather. Does Data Truck suffer from similar problems? A. Not usually. The reason satellite service is sometimes problematic is that the signal is being received from a geostationary satellite in space. The signal must travel about 44,000 miles round-trip, passing through Earth's atmosphere before it reaches you. During bad weather the signal is sometimes distorted and attenuated by dense cloud systems in the atmosphere, causing bad reception. 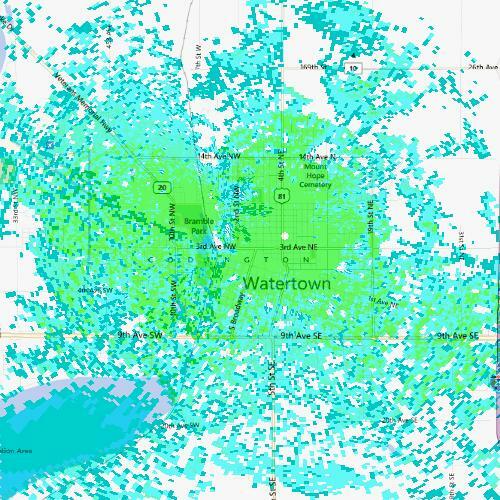 In contrast, our service is delivered from terrestrial transmitter sites in Watertown, SD. The signal has a much shorter trip and does not need to pass through the upper atmosphere, therefore it is much less likely to be affected by weather. Q. Sounds great! How do I get started? A. The easiest way to get started is to stop into our office at East Point Plaza on North HWY 81, 420 4th St NE, Lower Level Suite 17, Watertown. You can sign up today and have your modem online in minutes. You can also sign up for our service at A-I Computers on East Highway 212 in Watertown, SD. They are located at 1337 9th Ave SE (near HyVee). If you would like more information about WiMax, Click here to contact us or call us at (605) 886-7070. Q. Can I keep my current e-mail address? A. Yes. Although our packages include several @DATATRUCK.COM e-mail addresses, your current e-mail provider may be used to continue your e-mail hosting. (additional fees may apply, contact your current provider for details). You can also access any of the free e-mail services such as HotMail, Yahoo!, or GMail.